On November 14th, 2018, ICCER hosted a one-day session on Palliative Care & End of Life Care in Continuing Care. Our speakers, in Calgary and Edmonton, presented to an audience across Alberta, and including New Brunswick. On January 23, 2018, Coach Mark Marcynuk and Sandra Woodhead Lyons presented the workshop Communication Tools to Enhance Care to 23 individuals in Fort Chipewyan. 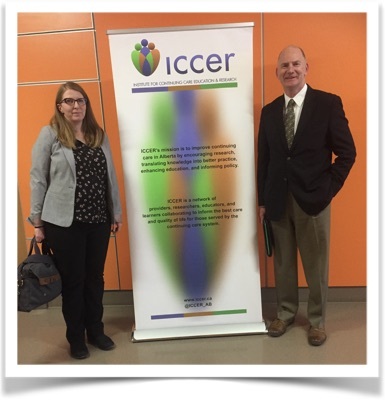 On November 22nd, ICCER was pleased to go to Fort McMurray and present a one-day in-person education event - Communication Tools to Enhance Care. Coach Mark Marcynuk and Sandra Woodhead Lyons presented the workshop to 41 extremely engaged participants. It was a pleasure meeting and working with them. On November 15th, 2017, ICCER and the Injury Prevention Centre hosted a one-day session on Falls Prevention in Continuing Care and the Community. Our speakers for the day presented on a variety of topics, including the role of technology in falls prevention, physical literacy, concussions in seniors and falls risk management strategies. We had host sites in both Edmonton and Calgary, with about 75 and 50 attendees at each, as well as 48 participants listening via teleconference and 30 videoconference sites booked across the province! It was our first time partnering with the Injury Prevention Centre and we look forward to continuing our relationship with them. On November 6th ICCER , Room 217 Foundation and the Winspear Centre held Music Care Conference 2017 in Edmonton. We had 200 people attending from all over Alberta. Our speakers, Mark Marcynuk and Dr. Jeff Small provided practical ideas for communication based in theory and research. At the beginning of the session participants were asked to write down what their intentions for the day were, and to identify why they wanted to improve their communication. The intent of the day was for each participant to take home at least 2-3 easily implementable ideas for improving communication with residents/family members. They were asked to go back to their sites and share this knowledge with their colleagues. The speakers encouraged questions and audience participation. We have to thank Jo-Anne Henson (UofA), Audrey Sand (CapitalCare), and Lynn Moulton (AHS) for their wonderful contributions. The main site was in Edmonton Clinic Health Academy, where we had 80 participants. There were also about 35-40 videoconference sites registered, including 3 from Ontario, 1 from New Brunswick, and 1 from Nova Scotia. On November 17th, 2016, ICCER Steering Committee member Dr. Erika Goble spoke at the Alberta Association on Gerontology networking dinner on "Is it Time to Stop Searching for a Magic Bullet? Re-examining the Role of Family-Staff Relationships in Quality Continuing Care". ICCER hosted "Implementing Music Care in Continuing Care" on November 9th 2016. We had two main sites (Edmonton Clinic Health Academy in Edmonton and Rockyview in Calgary), with an additional 25 sites joining by videoconference (from High Level in the north to Milk River in the south!) and over 30 teleconference lines. Sandra referred to Room 217 Foundation's 10 Dimensions of Music Care. 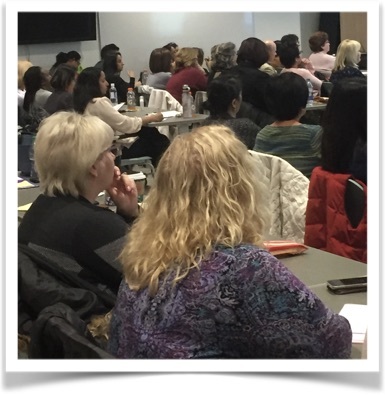 In April and May 2016 Dr. Sienna Caspar led six evidence-based workshops across Alberta on Creating Cultures of Care through Responsive Leadership. Workshops were held in Lethbridge on April 18, Edmonton May 4 to 6, and Calgary May 10 and 11. Each session focused on the use of daily care team huddles as a method of cultivating collaborative decision making, leading to improved resident care outcomes. The topics of the workshop included: strength-based leadership, five key leadership skills, mindfulness, relationship building and collaboration. On November 10th 2015 ICCER hosted an education session on Family/Staff Relationships in Continuing Care. We had 65 people in-person at Edmonton Clinic Health Academy, plus 41 teleconference lines and 21 videoconference sites. 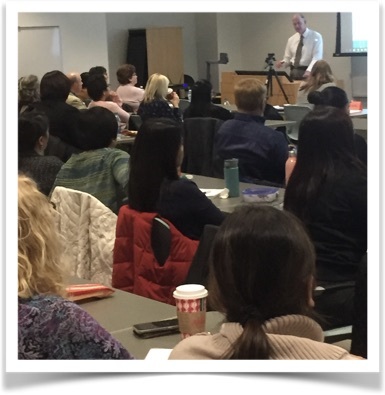 On February 18, 2015 we hosted an education session examining the use of Inter-RAI data to enhance clinical care. We had over 90 people in-house at ECHA, plus 26 teleconference sites and 19 videoconference sites. In October 2014 ICCER and the Alzheimer Society of Alberta and Northwest Territories hosted two sessions with Dr. David Sheard from Dementia Care Matters. In October 2013 ICCER hosted two sessions with Dr. Sienna Caspar on Creating Cultures of Care – How responsive leadership enables responsive care. On October 7th, we hosted an in-person session in Calgary with 30 participants. On October 8th we hosted an in-person session in Edmonton for 57 participants, with additional access via teleconference and videoconference. Dr. Caspar presented: Care providers in continuing care facilities are required to be in compliance with multiple regulations, policies and procedures while simultaneously considering the dynamic and unique needs of the residents for whom they care. Due to these organizational systems, adapting care routines in response to the individualized needs of residents can be extremely challenging, yet the ability to do so is central to the provision of person-centred care. Research indicates that the presence of responsive, empowered leaders encourages and enables the provision of person-centred care in continuing care. Through an exploration of the social organization of care in continuing care facilities, participants will have an increased understanding of the organizational systems that both support and inhibit responsive leadership behaviours. Recommendations for strategic initiatives that cultivate these leadership practices will be presented.